Strategy game similar to several boardgames. Played on a 7x7 grid, you can move your color blobs. If you end up adjacent to the other color, those blobs change to your color. Play until the board is full. The person with the most colored blobs wins. Hexxagon is a later similar game played on a hex grid. You can play against several AI opponents of varying difficulty. You get a certain number of moves per coin. A 1- or 2-player strategy game based on a 7x7 tiled grid. A player attempts to secure a greater number of tiles than his/her opponent by moving his/her playing pieces in a manner similar to checkers. Leland, the Ataxx maker, released 14 different machines in our database under this trade name, starting in 1985. Other machines made by Leland during the time period Ataxx was produced include Pig Out, World Soccer Finals, Dragon's Lair II, Brute Force, Danny Sullivan's Indy Heat, All American Football, Ironman Ivan Stewart's Super Off Road, Ironman Ivan Stewart's Super Off Road Track Pak, Viper, and Strike Zone Baseball. The dedicated machine has a very large, colorful marquee that contains several red and blue blobs. The control panel contains one red and one blue trackball and a button for each player. The more common conversion kit games use a joystick for cursor movement instead of a trackball. The object of the game is to fill the board with your colored pieces. This is done by moving your piece adjacent to your opponent's piece and turning his pieces to your color. Two types of moves can be made during the game: first, placing a piece adjacent to one of your own duplicates it or second, a piece may be moved two spaces, but it will not be duplicated. The number and arrangement of obstacles in the playfield changes between each round, so strategies must be changed in order to accomodate these barriers. Eventually, all the empty spaces on the board are filled and the player with the most colored pieces wins. In single-player mode if the human player wins, he or she must face a more difficult computer opponent in the next round. The Japanese version of the game was licensed to Capcom Japan. 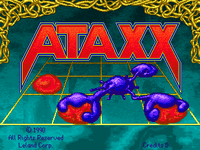 This is an implementation of the Virus and Ataxx board game that I made in Java for educational purpose.